The Nimzo-Indian Defense is an incredibly effective weapon for black against 1. d4, typically generating double-edged positions very early in the opening. This chess DVD will teach you the basic principles of the Nimzo-Indian Defense, placing special emphasis on recurring tactical and positional concepts to ensure your preparation is complete. After providing a general overview of the main ideas in the Nimzo-Indian Defense, GM Damian Lemos goes on to recommend his preferred responses in each of the main lines and sidelines by delving into his deep experience of playing the Nimzo-Indian at the Grandmaster level. GM Damian Lemos clarifies key points and breaking down critical concepts in the DVD for beginner and intermediate audiences. 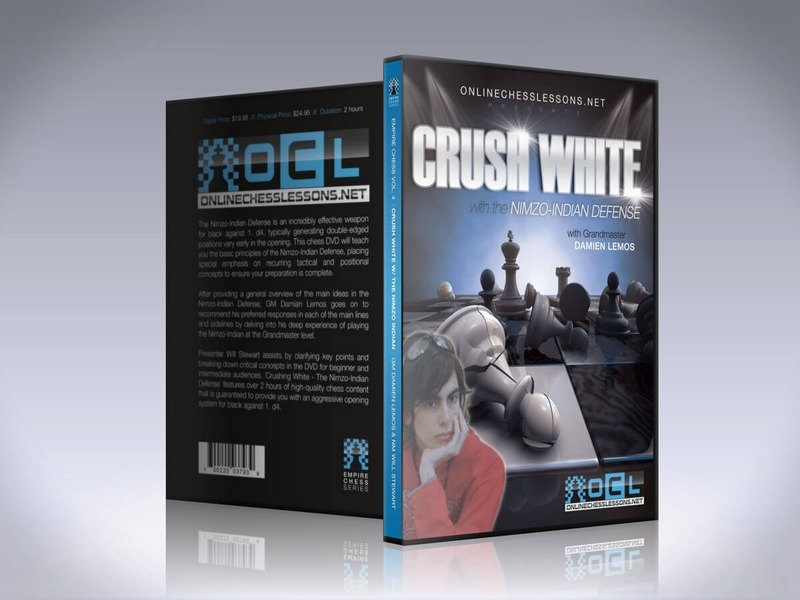 ¨Crushing White – The Nimzo-Indian Defense¨ features over 2 hours of high-quality chess content that is guaranteed to provide you with an aggressive opening system for black against 1. d4. RECOMMENDED SOFTWARE: ¨Modern Chess Opening Vol. 5 – Semi-Closed Games¨ includes 294 games/lectures that illustrate typical plans in the following openings: Nimzo-Indian defense, Bogo-Indian Defense, Queen’s Indian Defense and Catalan Opening. This chess program also includes more than 400 chess tactics exercises in these opening systems.